I’d say at least once a month I get a call from a client asking about what looks like an invoice for domain name renewal that they received in the mail. I just had another call from a client this morning asking if she should pay this … the answer is a resounding NO!! 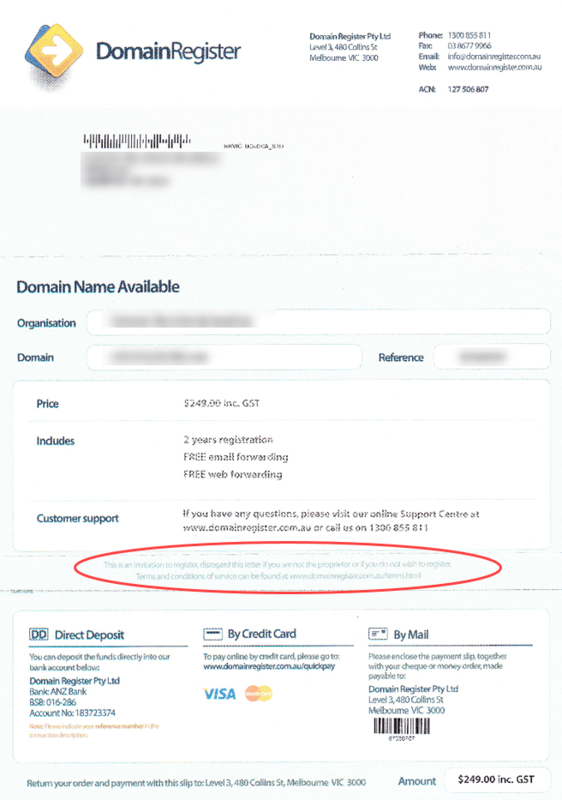 The letter will say something like “Domain Name Available” and “an invitation to register”… please don’t be tempted to pay this. Their website looks legit, they have a real address here in Australia, a phone number … yep it looks ok – but it’s NOT! These bottom feeders find your business domain that you already have registered, they then look for a domain you don’t already have and send you an ‘invitation to register’ it. Your web developer will already have identified what domain/s you need, so you can bet your bottom dollar you don’t need to take up this ‘invitation’. Apparently not, as nowhere does it say ‘Invoice’ on the letter. Tho the name, address, phone & website they go by might change – I guess when the scam reports highlight them too much they just start again with another identity – they are more than likely the same dodgy people behind it, preying on the technology info overload a lot of small business owners face these day. They’ve been around for quite some time, and they don’t seem to be going away anytime soon… but please don’t get caught by them. If ever you’re not sure about anything, a quick call or email to your web developer will clear it up quickly and potentially save you a motza!